In order to personalize your fundraising page, please following these instructions. We will refer to your fundraising page as a “campaign” below. If you have any troubles, don’t hesitate to contact us for further support. 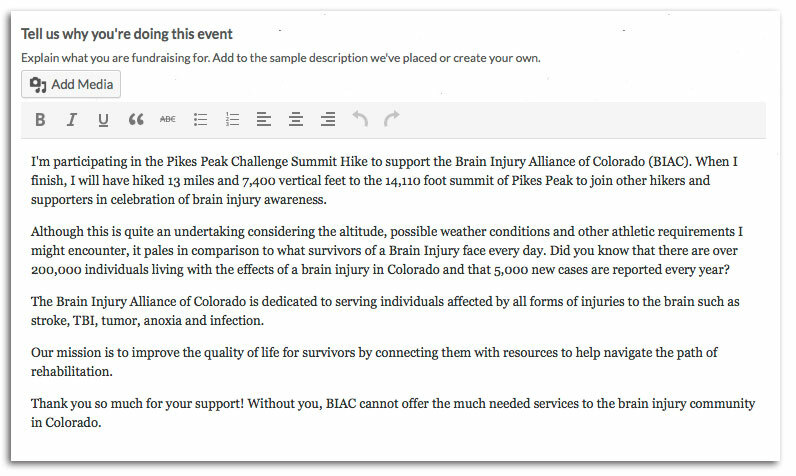 By personalizing your fundraising page, you are connecting with your donors on a personal level and telling them why the Pikes Peak Challenge is important to you. You should have received your username and password in your confirmation email. Please contact us if you did not receive this email. When you are done, be sure to scroll down and click “Update Campaign” for changes to take effect. 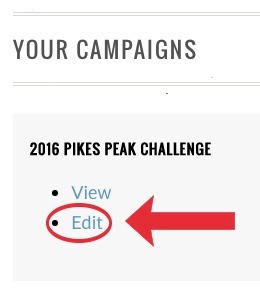 Everyone that registers for the Pikes Peak Challenge will have a default description placed in their campaign under “Tell us why you are doing this event.” The description shows on your personal page and explains what you are fundraising for. Simply place your cursor in the text box as shown below and add to the sample description we’ve placed or create your own. Scroll down and click “Update Campaign” for changes to take effect. **Please note that personalizing your profile is not necessary – your profile page has been automatically set up and if you do not wish to follow these steps you will still be able to receive donations. You just need to pass along your page link as stated in your event confirmation email.